Without Toady Thompson, Bristow would have no one to praise his writings. When the management take away his supply of paper, it is Thompson who encourages Bristow to keep going using old envelopes and scraps. Thompson’s verdict on Living Death and the rest of Bristow’s oeuvre is invariably "brilliant". When Bristow tells him of his rejection by Heap and Trotwood, Toady calls down "a plague on both your houses". Strip 2770 was published in the Evening Standard in February 1970 and in Bristow (1970), from where this scan was taken. He is the strange choice of Herod in the firm’s Nativity Play and apologises humbly to Mary and Joseph for any inconvenience caused. 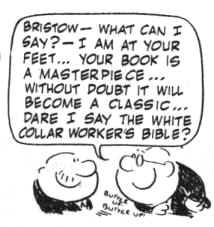 (Of course Bristow knows the perfect replacement, a man who would happy to be seen in a cruel and heartless role - Peterson of Public Relations). Holiday postcards from other clerks always start "Dear Slaves" but not those from Toady. He wishes his colleagues were with him. He wishes his bosses were with him. He even wishes the building itself was with him. The most loyal of workers, Toady is devastated the morning he sleeps late and has to catch a train with Bristow (for whom arriving late is an art form). When Toady proposes that they share a taxi Bristow, quite understandably, swoons on the spot.
. Of course before he gets to the canteen he must be persuaded to leave his office. The two men who regularly stroll round the corridors hear his boss telling him to break for lunch. "You mean G-G-G-Go outside for L-L-L-lunch?" goggles a gob-smacked Thompson. He must have conquered his fear because in a later strip he visits Duggie's Tattoo parlour in a street near C-Ps. Duggie is not sure if he is able to carry out a rather unusual request - "This is difficult Mr. Thompson, I've never seen the Chester-Perry building". In 2004 on frankdickens.com we learned that TT is practicing synchronised toadying. This highly skilled social activity requires a number of experienced toadies who exhibit identical reactions to whatever their boss does (eg he cracks a small joke they all split their sides laughing). Lets hope this one catches on. Thompson can toady for England. But the strangest development came three years later. To Bristow's amazement (and possibly jealousy) we find that Toady is having a relationship with - wait for it - Miss Sunman ("His name's not Toady, it's Ronald"). Words fail even the author of this website. Ronald indeed.